Silver Falls State Park is located in Marion County, just down the road from Silverton, Oregon. It is Oregon’s largest park, boasting over 9,000 acres and more than 40 miles of hiking and horseback riding and bike trails. The popular Canyon Trail follows the banks of Silver Creek and passes ten substantial water flaws in less than ten miles. The Canyon Trail is exceeding popular in the summer months, but can be quite beautiful in the winter as well. Here is an image of the Lower South Falls in early January, with a dusting of snow and the evening sun warming the forest above. (Click on the image to see a larger version). 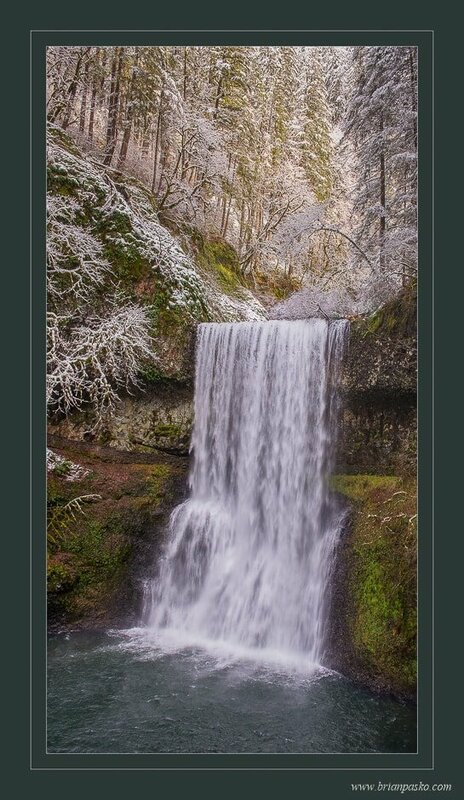 Today, more than one million visitors come to the enjoy the park annually and is managed in partnership between the Oregon State Parks ad the Friends of Silver Falls State Park.